SmartFit Reusable Earplugs are a marvel of user-friendly design. Ears are like people - each one unique and different. The only multiple-use earplug with Conforming Material Technology,™ SmartFit uses body heat to adapt to the shape of the ear canal for a comfortable, personalized fit. With a detachable cord system, HearPack® carry case and special application styles available, it's the ultra-smart choice for today's diverse workplace. (NRR 25) SmartFit Earplugs With Removable Cord and sturdy hearpack carry case are the only reusable ear plugs with Conforming Material Technology,™ which uses body heat to adapt to the shape of the ear canal for a comfortable, personalized fit. Case of 1000 Pairs - Best Pricing! Howard Leight by Honeywell SmartFit Reusable Ear Plugs w/Removable Cord and HearPack Carry Case (NRR 25)5Mr GESeptember 19, 2018Great Fit!!! Reusable!!! Great sound Protection!!! I wish I would of had these years ago!!!! Maybe i wouldn't of got Tinitus!!!! Howard Leight by Honeywell SmartFit Reusable Ear Plugs w/Removable Cord and HearPack Carry Case (NRR 25)5GlenJuly 24, 2017My last batch of ear plugs was getting a little nasty-looking even after repeated washings, so I ordered a new batch. Same great noise abatement as before. I do like the fact that these are always comfortable, even on long bike trips, and they can be cleaned up for the next ride. Occasionally I will take a short ride on my motorcycle without ear plugs....and that always reminds me why I wear the Howard Leight product on a regular basis. Howard Leight by Honeywell SmartFit Reusable Ear Plugs w/Removable Cord and HearPack Carry Case (NRR 25)4DDSeptember 12, 2016Easy to use, work very well, and they are comfortable. Have used them for several years for shooting trap, and with power tools. Howard Leight by Honeywell SmartFit Reusable Ear Plugs w/Removable Cord and HearPack Carry Case (NRR 25)5GlenJuly 30, 2016Tried 'em all keep coming back to these for use under a motorcycle helmet. Great noise reduction, comfortable under a helmet, and easy to clean. Last quite a while too. Howard Leight by Honeywell SmartFit Reusable Ear Plugs w/Removable Cord and HearPack Carry Case (NRR 25)4Tango MikeJuly 17, 2016I ordered 4 types of ear plugs. This one came #3 yet it is a good plug. It goes a bit too deep in the ear canal for me, but might not affect anyone else as our ears are made different. again-good plug... Thanks. Howard Leight by Honeywell SmartFit Reusable Ear Plugs w/Removable Cord and HearPack Carry Case (NRR 25)5DaleSeptember 8, 2015These are awesome! I use them all the time riding my motorcycle. The case is also well designed. I've order about 6 pairs to make sure I have spairs and gave one to a friend who is also wearing them while riding his motorcycle. Howard Leight by Honeywell SmartFit Reusable Ear Plugs w/Removable Cord and HearPack Carry Case (NRR 25)5JimJune 2, 2015There are the ones! Obviously its the material that makes the difference. They conform to my non-cylindrical cross-section ear canals. Only takes a few seconds of steady mild pressure to warmup and seat in the ear canal. I've worn ear plugs on the jobs and for shop work, gardening, and home repairs since 1969. They stay put, and are not uncomfortable at all. Howard Leight by Honeywell SmartFit Reusable Ear Plugs w/Removable Cord and HearPack Carry Case (NRR 25)5StevenApril 13, 2015These are the best ear plugs that I have ever used. They are very comfortable, easy to insert, and high visibility. I will be buying more of them in the future. Howard Leight by Honeywell SmartFit Reusable Ear Plugs w/Removable Cord and HearPack Carry Case (NRR 25)5Glen T.September 16, 2014I wear them while riding my motorcycle. Keeps the wind noise at bay. Great fit and actually the best I have found among all the resuables that I have tried. Howard Leight by Honeywell SmartFit Reusable Ear Plugs w/Removable Cord and HearPack Carry Case (NRR 25)5Anne RymshaJune 27, 2014Best I've ever had. No more barking dogs, chirping birds, chatty walkers or snoring husband. They're also comfortable. Your really don't know you've got them in. Howard Leight by Honeywell SmartFit Reusable Ear Plugs w/Removable Cord and HearPack Carry Case (NRR 25)5TomFebruary 1, 2014The best earplugs i have ever used! Howard Leight by Honeywell SmartFit Reusable Ear Plugs w/Removable Cord and HearPack Carry Case (NRR 25)5jfredenJanuary 12, 2014Have used these before...but were not the 'current' rounded end style...previous ones were conical at the end. These do no insert nearly as well as the previous/conical shape. Glad I have some of the older ones available. GO BACK TO THE PREVIOUS SHAPE PLEASE. Howard Leight by Honeywell SmartFit Reusable Ear Plugs w/Removable Cord and HearPack Carry Case (NRR 25)4Glen T.October 8, 2013I just ordered a five-pack of these earplugs because they are the most versatile and user-friendly that I have found for motorcycle riding. The noise reduction is very good, the fit is comfortable. I have found foam plugs to be the best for noise reduction but they are cumbersome to use and wear out quickly. These do not wear out, can be washed frequently and have an adequate universal fit. I have tried most of the other brands of reuseable plugs of this style and found these the best overall. Howard Leight by Honeywell SmartFit Reusable Ear Plugs w/Removable Cord and HearPack Carry Case (NRR 25)5FrankSeptember 12, 2013You can't get a better Ear Plug then these. From a active AR-15 shooter they do the job very well blocking out the noise. Howard Leight by Honeywell SmartFit Reusable Ear Plugs w/Removable Cord and HearPack Carry Case (NRR 25)5Lorenz J KertzJuly 1, 2013Formerly used Howard Leight Air Soft Reusable Ear Plugs (NRR 27). I've found the SmartFit Reusable Ear Plugs NRR 25) to be superior in comfort and equally reliable in noise reduction. The fixed size and ridges of the Air Soft Ear plug would hurt my inner ear and were extremely uncomfortable to sleep with. The SmartFit ear plug conforms so much better to the contours of my ear canal and don't hurt my ear canal even during sleep. They're easy to use and remove. I use them during noisy yardwork (mowing grass) and in noisy environments where I'm bombarded with multiple inputs of varing frequency. The ear plugs give me the space I need to function rather than allowing me to be overwhelmed by the noise. Howard Leight by Honeywell SmartFit Reusable Ear Plugs w/Removable Cord and HearPack Carry Case (NRR 25)4SteveMay 30, 2013Comfortable and good noise reduction. The case slips into a pocket nicely. I lost my last pair a couple of weeks ago and tried several other brands from drugstores and gun shops, but could not find the fit and performance of the SmartFits; I've been using them for about eight years; they work well under a full face helmet and cut wind noise at speed; I use them daily on my ride to work. Ear Plug SuperStore's service was outstanding and a very good price. Thanks! Howard Leight by Honeywell SmartFit Reusable Ear Plugs w/Removable Cord and HearPack Carry Case (NRR 25)5Geneviève MongeauMay 5, 2013Just a few words to tell you that I'm totaly satisfied with the reusable (NRR 25) ear plugs! Comfortable, easy to maintain long-lasting! Congratulations! From a satisfied customer. Howard Leight by Honeywell SmartFit Reusable Ear Plugs w/Removable Cord and HearPack Carry Case (NRR 25)4Mark NeighborsApril 22, 2013I used to get these or similar from a national pharmaceutical store and they stop selling them. I ride a motorcycle and always need good protection for my ears. I have come to use them when I want to read/work in quiet or on the plane for travel - they are great! Howard Leight by Honeywell SmartFit Reusable Ear Plugs w/Removable Cord and HearPack Carry Case (NRR 25)5Tami PlummerApril 15, 2013Best choice since similar ones that I normally used have been discontinued. I use them due to my husband snoring, I cut the stems down and sleep just fine. Please don't discontinue these! Howard Leight by Honeywell SmartFit Reusable Ear Plugs w/Removable Cord and HearPack Carry Case (NRR 25)4Tim PalmerNovember 23, 2012These are very comfortable under normal conditions, the sound suppression is excellent. I didn't give them 5 stars only because of my personal use... I bought them to use with my motorcycle, the stems are long enough that they can cause some pain when removing the helmet. A shorter stem would solve this but unless you are using them under a helmet they are excellent. Howard Leight by Honeywell SmartFit Reusable Ear Plugs w/Removable Cord and HearPack Carry Case (NRR 25)5NubbJune 15, 2012Very Comfortable, good noise reduction. I can usaully wear a pair for about a month before replacing. I wash them nightly, pat dry and store in the hard case. Cloth cord is much nicer that the plastic type. Howard Leight by Honeywell SmartFit Reusable Ear Plugs w/Removable Cord and HearPack Carry Case (NRR 25)4Don RoyerApril 13, 2012I would give these a B+ for sound suppression and a B+ for comfort. Howard Leight by Honeywell SmartFit Reusable Ear Plugs w/Removable Cord and HearPack Carry Case (NRR 25)4NormJune 22, 2011Very good. Although, some people may not tolerate them for long periods of use. Dampens noise dramatically. Howard Leight by Honeywell SmartFit Reusable Ear Plugs w/Removable Cord and HearPack Carry Case (NRR 25)4FredMarch 30, 2011I have bought several types of ear plugs, trying to find one that works well and is comfortable for long periods of time. I would have to rate this particular brand higher than many others I have tried in the past. Howard Leight by Honeywell SmartFit Reusable Ear Plugs w/Removable Cord and HearPack Carry Case (NRR 25)3KathleanJanuary 15, 2011Sound suppression was excellent on the airport flight-line. I could hear the voices of my coworkers almost as well as without them, but the lower range of aircraft jet-engines was reduced to a negligible level. Higher-pitched whines were not filtered as well, but still effective. They lost points on comfort. I didn't notice any difference with the "Conforming Material Technology." My main experience of them was that they were slightly difficult to seat and abrasive to my ear-canal. I think they might fit someone with larger ear canals better--I am a woman with fairly small ears. 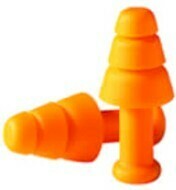 I am still looking for other earplugs and will not be using these.